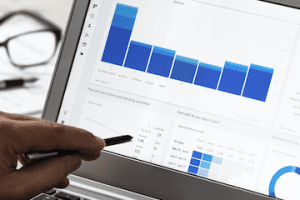 Over two years ago, we published an “SEO Report Card” for SolsticeSupply.com, an ecommerce site dedicated to closeout winter goods ranging from skis and snowboards to winter apparel. With a final grade of D+, the review didn’t go well for founder Justin Clapick, who requested it. Clapick recently contacted us, again, for a redo — after launching his new Magento Enterprise store. Let’s see how it compares. In addition, the alt attributes are similar to the words used in the graphics, but are noticeably more grandiose. 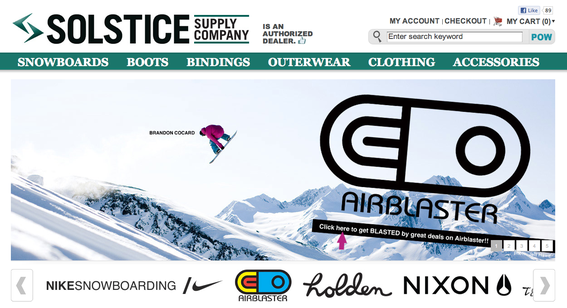 For example, the alt attribute for the Nike snowboards image in the main carousel reads, “The Best Price on Nike Snowboarding Boots and Outerwear.” The words embedded in the image itself, however, make a more fact-based and less sensational claim: “20-40% off Nike snowboarding gear.” If you can’t make the claim for your customers to see, do not place it where only bots will see it. SolsticeSupply has made inroads in providing more textual content on the home page, however. In the second page view, feeds from Facebook, YoBeat, ResellerRatings and gearSlash place relevant text on the page. However, content is not unique to SolsticeSupply. It may help increase the keyword relevance signals that the home page sends, but the engines recognize this to be syndicated from other sources. The only content unique to the SolsticeSupply home page is “We are your Discount Snowboard gear destination for the Best Brands at the Best Prices….. Guaranteed. Come inside and get the gear that will help you have the best winter ever!! !” This is better than it was, but still a very small amount of unique content on the home page. Interestingly, not only is the H1 heading tag on the home page wrapped around the SolsticeSupply logo, but when CSS is disabled the logo is replaced by the words “Magneto Commerce.” The link title and the image alt attribute also say “Magneto Commerce” despite the visual content and links clearly referring to SolsticeSupply. 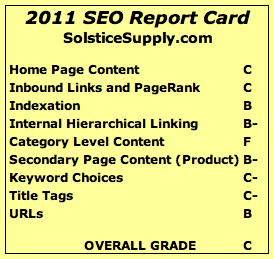 2009 "SEO Report Card" for SolsticeSupply.com. In terms of external link popularity, the site seems to have suffered a major decrease since the numbers reported in 2009. Google shows no visible PageRank at the home page, and Yahoo! lists a total of 680 links to the entire site when its own navigational links are discounted. What’s more, the diversity of the link portfolio is also quite poor. Half of the links are attributable to just seven domains. The domains that link from just one page or another tend to be topically relevant, which is very good, but the quantity is quite low. Building high-quality links is in order, including making sure that the site is in all the reputable niche snow-sports directories. Yahoo! reports 4,382 pages on the site, up about 25 percent from two years ago. 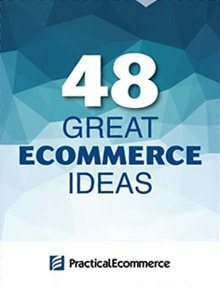 Without knowing more about the number of products the site sells, and whether that number has increased or decreased in the last two years, all I can say is that indexation is happening. 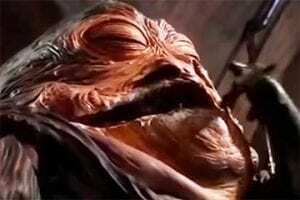 So at least we know we don’t have a major crawler roadblock in the site’s architecture. If the number of products is dramatically larger than the number of pages indexed, the company would need to take a close look at which types of pages aren’t getting indexed, fix the blockage, and post an XML sitemap to ensure that all of its pages are considered for rankings. Or if the product catalog is only 500 products, there may be a duplicate content issue to control. Here’s where it gets really interesting. 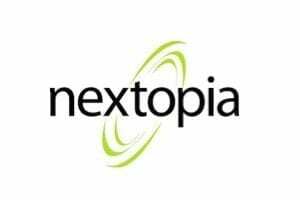 A move to a new platform always impact a site’s search engine optimization, because the search engines see so many things from URLs to page templates to navigation change in what appears to them to be the blink of a robotic eye. I was extremely pleased to see that SolsticeSupply had 301 redirected every 2009 URL I tested to its 2011 version. This is an often missed or bungled step, so kudos to the company for harvesting its preexisting link popularity to start the redesigned site off as strongly as possible. With the redesign, though, the two biggest changes in the internal linking structures are the category navigation terms across the top header and the differences in the treatment of brand navigation. Today’s header uses much more relevant words as its category links: “snowboards,” “boots,” and “bindings.” In 2009, these important words were hidden under the “Winter Gear” category, relegated to less important subcategory pages as opposed to more important category pages. This is a very positive move for SolsticeSupply’s navigation, and I would expect the organic search referrals in its analytics to reflect this positive change. On the other hand, brands have been demoted. In 2009, every brand was listed in the “Brands” rollover menu. 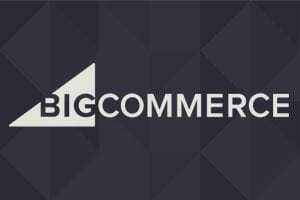 Consequently, because every page on the site bears this navigational header, every page on the site linked to every brand. That’s a lot of internal link juice flowing to the brands. In the redesign, brands were removed from the header navigation. They still have a place — twice — on the home page. But no other page on the site links to the primary pages for all the brands. Assuming the product brand terms are valuable to SolsticeSupply, this would have a negative impact on the company’s ability to rank for these highly competitive keywords. 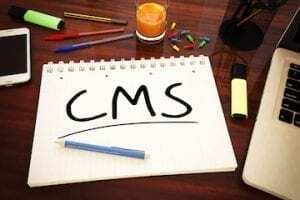 The site still uses cascading style sheets — CSS — in such a way that search engines are able to see and crawl the entire navigation, and has added landing pages for the major categories that were missing in 2009 as well. Like the home page, the templates for category and product pages heavily favor images and lack spaces for HTML text — as in no text whatsoever. The product images are labeled and priced and the navigation remains, but no other text is present on the category and subcategory pages. Not an HTML heading, no body copy describing the page, nothing. As a user, I’m not even really sure I clicked on the right page. Where am I? For example, the page at http://www.solsticesupply.com/outerwear should theoretically be targeting the phrase “snowboard outerwear.” The only place these two words are mentioned is in the navigation, which is present on every page. So you could say that every page is both equally optimized and not optimized for “snowboard outerwear.” One HTML heading and 2 to 3 sentences of unique text describing the products offered on this page are all that’s needed, but it needs to be designed into the template. As in 2009, the product pages are perhaps the closest to optimal. The templates provide ample room for textual, descriptive content. The editorial voice is unique, and unique content is critical to demonstrating content quality. Still, the keyword choices used in the content could be much more strategic. Let’s take the “Airblaster Awesome Pants : Berry” product page. 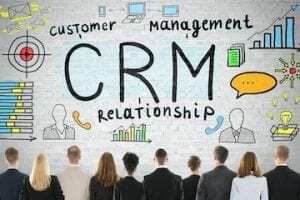 If the customer knows exactly what product she wants and searches for the exact product name, this page has a chance of ranking. 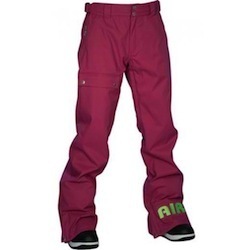 However, most searchers will be looking for “womens snowboard pants” or “airblaster snowboard pants” or maybe “ pink airblaster pants.” None of these phrases are used on this page. The content is focused solely on being cool and entertaining the audience. That’s very important, I agree, but if you don’t sprinkle in some relevant keywords, searchers won’t get to this page to be impressed by your awesome copy written in their voice. Title tags, the most important on-page element in SEO, took a big step backward in the redesign. 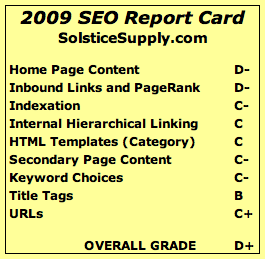 The 2009 scorecard indicated that title tags were unique across the site. With the redesign the key middle layer accessed by filtering product attributes on a category page lacks unique title tags. The subcategory page inherits its category page’s title tag. For example, the page for Women’s Pink Outerwear has the same title tag as the Outerwear category: “Snowboard Outerwear | Snow Clothing | Snowboarding Gear Sale.” Every page, especially valuable subcategory pages like the ones created by the filtered navigation, must have a unique title tag. The home page title tag is twice the recommended length at 127 characters. “SolsticeSupply.com: Snowboard Gear and Clothing from Nike, Airblaster, Holden, Lib Tech, Nikita, Electric, GNU, Dakine and Neff “ Attempting to include everything, it focuses on nothing. 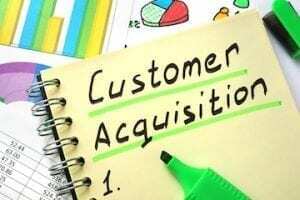 In addition, the title tag leads with the brand, which is a waste of valuable optimization real estate. If your home page can’t rank for your unique brand without sticking it in the front of the title tag then the site has some serious SEO problems. Instead, try something shorter and more focused like “Snowboard Gear and Clothing on Sale | SolsticeSupply.com.” For the purposes of this report card I haven’t done the keyword research necessary to recommend an exact optimal title tag, but this is a decent example. The URLs are just fine. For the most part they’re short and descriptive. In the subcategory-filtered navigation level the keywords disappear in favor of parameters. For example the URL for Women’s Pink Outerwear (http://www.solsticesupply.com/outerwear?cat=18&color=85) would be more relevant to search engine crawlers and searchers alike as http://www.solsticesupply.com/outerwear/womens/pink. However, dynamic, parameter URLs don’t present the crawler challenge that they did in years past. In fact, SolsticeSupply locked down the one thing that could have tripped them up with dynamic URLs: allowing the order of filter selection to influence the URL. Whether the user chooses the pink filter first or the women’s filter, the parameters remain in a predetermined order in the URL. This is excellent. Overall, SolsticeSupply is a site clearly designed with the user in mind. It’s cool, flashy, and speaks the language that its customers speak. 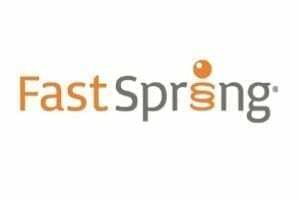 The challenge for SolsticeSupply will be to inject enough SEO best practices and smart keyword usage into the site to attract more of those customers.